I don’t think I would have appreciated this movie if I had seen it when I was teenager. In fact, I don’t think I would have really appreciated the movie when I was in college. It was after I got out into the real world after graduation did I start to understand fans. I have always been a fan of sports and I never really gave thought to the different kinds of fans out there. Then when I started to work for Examiner.com and cover the 49ers, that’s when I got it. I would meet fans of all different kinds. Some casual fans who just want an autograph. Some fans would camp outside the team headquarters seeking to see their players. Some fans would go with the full merchandise-wearing ensemble. There were some extremes too. Having seen thees fans so much over the course of three years, and interacting with so many of them on social media, I understood the obsessive fan. So now, the movie did intrigue me. It’s a story about people I have met. People I have seen and experienced. It was all too real. Sadly, the movie did nothing to tell that. We saw glimpses of the obsessed fan and part of some nature that may have been the root of his mental state. But because the movie was so out of place, we never got a chance to see any character development. Even in terms of character background, there was little to none. And if the audience was just a casual person, they might not understand it. There is a reason why a fan of a team or a player goes to lengths like this. Sometimes they feel that they can mean something to the athlete. Or maybe they can just have that one moment of glory during tough times. And when the mind is not ready to accept reality, that’s where the game no longer becomes a game. Fans have put the game and the athletes as idols. They worship everything about it and get defensive when you don’t see it that way. As much as I love sports, I know it’s just a game. There may be many things tied to it that are important. But I know the boundaries. So yes, the movie’s premise is real. There are people like that. It’s sad that they find their escape in sports but never come back to reality. This movie, sadly tried to tell that story but failed miserably. Aside from the numerous errors in stadium shots, uniform shots and realism of the sports, it felt rushed and too fast paced. It sped through too quickly and none of the story got a chance to sink in. But maybe that was the pace that the movie intended to go. With the soundtrack of Nine Inch Nails playing during scenes in the movie, maybe the whole theme of the movie was to be in the mind of a crazy fan. It’s a novel concept, but it doesn’t help the storytelling. Like an obsessed fan, it’s kind of unstable and all over the place. There is some reality in this unrealistic story. And in a way, it is perfect parallel to the obsessed fan. 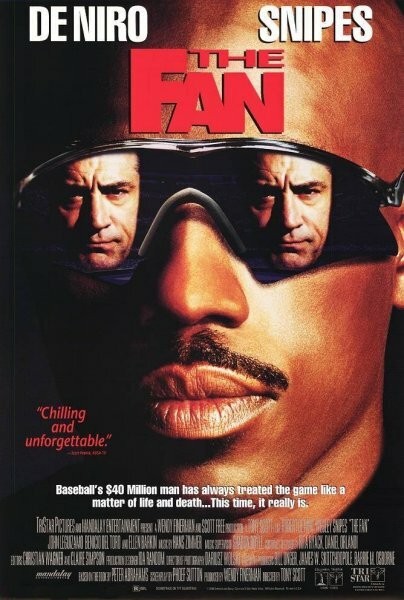 This entry was posted in Baseball, Movies and tagged Fan Behavior, The Fan. Bookmark the permalink.